A putty epoxy that replaces metal. 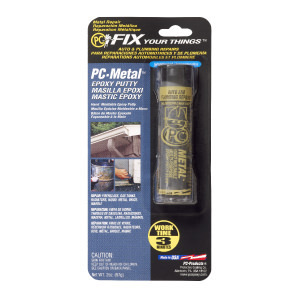 PC-Metal™ Putty Epoxy replaces metal. Mix with fingers and apply. 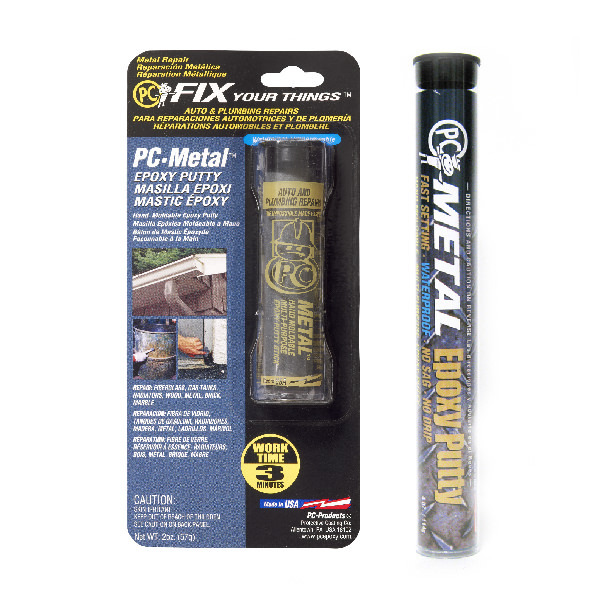 Quickly PC-Metal™ cures to reattach metal (30 min). Cures hard, fast, nonconductive. Contains metal – sticks to metals such as cast iron, zinc, aluminum, stainless steel, steel and copper. Remove contaminants such as dust, dirt, oil and grime with a solvent such as denatured alcohol (ethanol), acetone, rubbing alcohol (isopropyl alcohol) or lacquer thinner. Mild detergent solution in water is also good removing contaminants. Use a clean paper towel or rag for wiping. 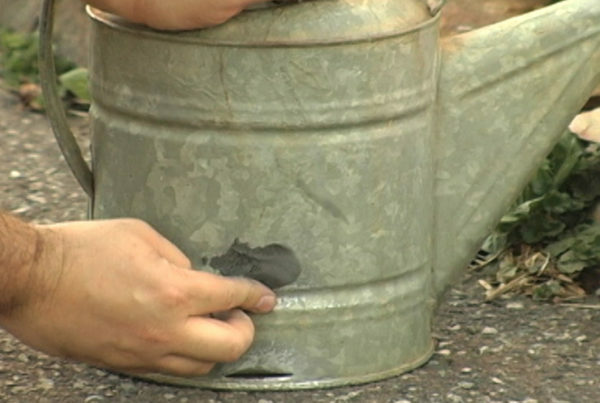 Remove rust and loose paint with sandpaper or wire brush. Epoxy typically sticks to most paints. If there is a concern of the paint’s adhesion then remove it with sandpaper, wire brush or paint stripper. Smooth, glossy and shiny surfaces should be roughened using sandpaper to increase adhesion. Adhesion to wet or damp surfaces can be improved by wiping with alcohol. Do not use mineral spirits or paint thinner for removing contaminants. We recommend wearing disposable gloves when mixing and applying epoxy putty. Remove from skin with soap and warm water. Clean up mixed epoxy before it cures with paper towels and solvent. Denatured alcohol (ethanol), acetone, rubbing alcohol (isopropyl alcohol) or lacquer thinner are suitable solvents for removing uncured epoxy. Cured epoxy can be physically removed by prying off with a screw driver or pliers. It can also be removed with paint stripper or remover. Can PC-Metal™ plug a hole in a 55 gallon drum? 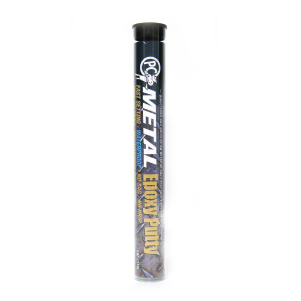 PC-Metal™ is an excellent product for quickly plugging a hole made in a drum. PC-Metal™ has a strong odor. Does the smell go away? PC-Metal’s™ odor stops after it cures. PC-Metal™ is dark gray, dense and hard when cured. Is it as strong as metal? PC-Metal™ is a product that is designed to look like and cure hard like metal. It is excellent for bonding and filling metal objects but is not as strong as steel, aluminum and other metals. How fast does it cure? How much should be mixed? PC-Metal™ is very fast curing. It is important to mix small portions for 45 to 60 seconds and immediately apply to the surface. Within 3 to 5 minutes PC-Metal™ cures very hard. In less than 60 minutes PC-Metal™ reaches its full hardness. What kind of metal is in PC-Metal™? Does PC-Metal™ rust? It is an alloy of iron and aluminum. It will not rust. Can PC-Metal™ be machined? Can it be tapped or cut? Cured PC-Metal™ can be drilled and cut. Tapping threads in PC-Metal™ is not advised. It is better to set the bolt or threads in the mixed PC-Metal™. Coat the threaded screw or bolt with release agent if it needs to be removed. 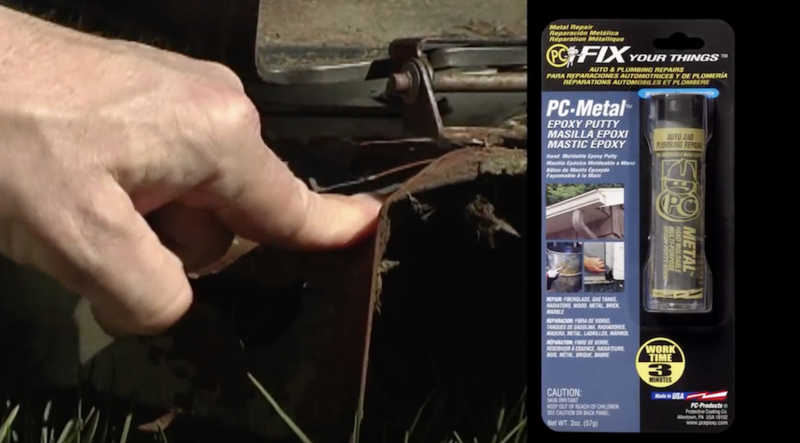 Can PC-Metal™ be used to seal a cracked engine block? PC-Metal™ has many automotive uses even repairs to engines. Mixing small portions of PC-Metal™ for 45 to 60 seconds and immediately applying is critical. Mixing for too long may affect the adhesion if the work-life is near completion. Also, surface preparation is important – surfaces that have contaminants such as cutting oils or grease will affect adhesion. Many plastics are not good surfaces for epoxies to stick to.